I initially was planning to just build a modern espresso dining table using an existing red oak plywood top with some nice edge banding. Most of the tables sold in stores in $2000-3000 range are either ply or MDF covered with veneer or laminate. I am not talking about rustic style tables with a slab top, I am talking about very polished modern tables that you see in Macy’s or other furniture stores. 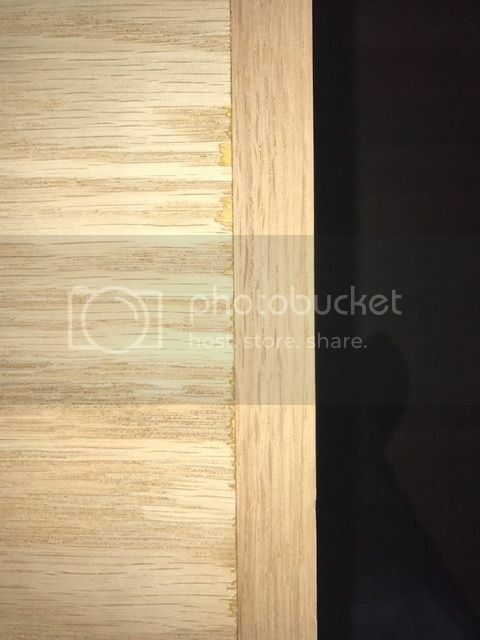 So, I went to a nice lumber store around here in Seattle, and purchased cabinet grade 4×8 sheet 3.4 thick red oak ply. My initial thought was that if the original plywood would have a “nice” veneer, then I will be all set! However, when I cut the ply with my saw at home, some chipping of the veneer occurred at the edges (see the pic), and leaving it as is would not look “professional”. Plus, the tables that we really liked in the store had a fully veneered seamless top. (Ash veneer) And, I really did not want to see the edge banding. 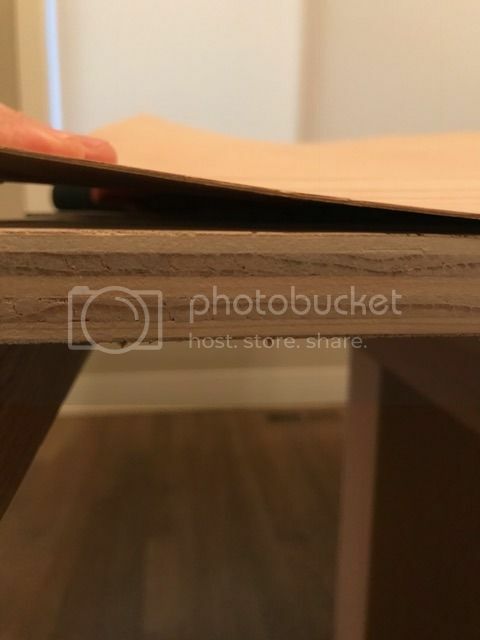 So, since I already build the whole base out of solid red oak, I decided to veneer the top and sides of my table top to hide the “chipped plywood” and the wood joints on the site ( I unfortunately did not miter the edge wood). I just want to have a nice, clean, modern finished look. My wife wants a dark espresso and I will cover it with several coats of poly. I did some “research”, and then found out about oakwood veneer. 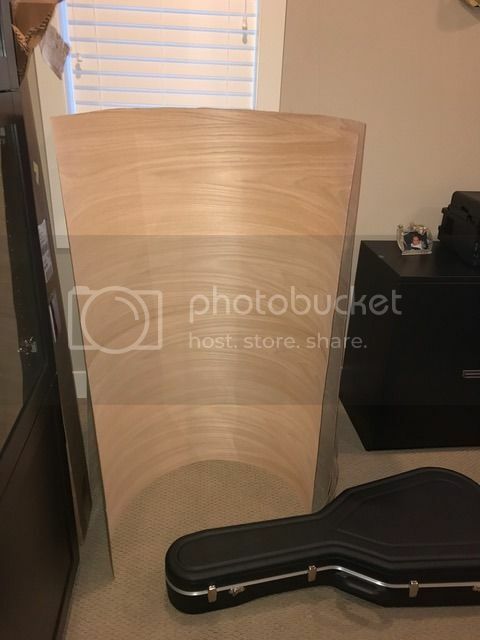 I called them and explained to them my situation, and they recommended that I purchase a 5×10 sheet (my table is 50” wide) of 22.2 mil BFV Red Oak veneer. They said that its a thick and durable veneer. And in fact, when compared to the veneer that was originally on my plywood, this veneer does seem like its a thicker veneer (see the pic).